The Ovation Keyboard Tray System combines the proven quality and exceptional adjustment range of the Knape and Vogt Ovation Leverless Arm with the durability and low profile of the Foxbay ABS Plastic Keyboard Trays. Multiple widths and depths of tray are available, permitting users to select the tray that will best accommodate their keyboard and mousing devices while still fitting within the space constraints of the workspace. The high quality Ovation Leverless Arm offers an exceptional range of elevation adjustment that can meet the needs of virtually any seated individual. The low profile, durable design uses a near-effortless patented "Lift-N-Lock" counterbalance mechanism to adjust an attached tray from 7" below to a full 3.75" above the mounting point. A Height Indicator Gauge makes adjustment easy to measure. The inclination, or "tilt," of the tray can be adjusted from a negative inclination of -15° to +10° using a large Dial-a-Tilt knob that includes an "Inclination Gauge" (allowing the user to reposition at the desired angle). The sleek, low profile design provides excellent clearance for the legs and knees. The arm swivels 360° for side to side movement and the 23" storage track allows the user to store the arm and tray out of the way when not in use. The high quality steel ball-bearing storage track has a much longer lifespan than the more common plastic glide systems used by most manufacturers and ensures years of smooth, virtually effortless storage movement. 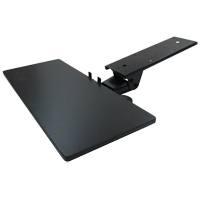 The ABS Plastic Low Profile Trays are just 0.375" thick and are free of any surface obstructions, providing the greatest flexibility to the user in terms of arranging keyboards, mice, palm supports, etc. The rear edge has a Keyboard Guard which serves to keep both keyboard and mouse from slipping off the back edge when the tray is put in a negative inclination. It also protects the keyboard from the underside of the desk when stowing the tray (if the tray is too high, the "guard" will catch on the desk, protecting the keyboard from possible damage. Lastly, notches in this guard provide cable management for the keyboard and mouse. Note: Deeper (13") trays project about 2" with the standard Ovation model. If there is sufficient depth to mount a 28" track the Ovation Long Track Keyboard Tray System will provide complete storage of the deepest trays. The Ovation Long Track Keyboard Tray System combines the proven quality and exceptional adjustment range of the Knape and Vogt Ovation Leverless Arm (28″ track) with the durability and low profile of the Fox Bay Industries' ABS Plastic Keyboard Trays. Multiple widths and depths of tray are available, permitting users to select the tray that will best accommodate their keyboard and mousing devices while still fitting within the space constraints of the workspace. The high quality Ovation Leverless Arm offers an exceptional range of elevation adjustment that can meet the needs of virtually any seated individual. The low profile, durable design uses a near-effortless patented "Lift-N-Lock" counterbalance mechanism to adjust an attached tray from 7" below to a full 3.75" above the mounting point. A Height Indicator Gauge makes adjustment easy to measure. The inclination, or "tilt," of the tray can be adjusted from a negative inclination of -15° to +10° using a large Dial-a-Tilt knob that includes an "Inclination Gauge" (allowing the user to reposition at the desired angle). The extended 28″ long track achieves full storage of deeper trays such as the Extra-Deep Low Profile ABS Plastic Trays from Fox Bay Industries. 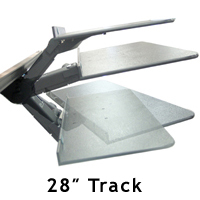 The longer track is most often deployed in corner applications where there is sufficient mounting space but should fit anywhere that 28" of space is available. The sleek, low profile design provides excellent clearance for the legs and knees. 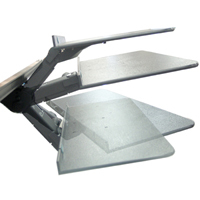 The arm swivels 360° for side to side movement and the 28" storage track allows the user to store the arm and tray out of the way when not in use. The high quality steel ball-bearing storage track has a much longer lifespan than the more common plastic glide systems used by most manufacturers and ensures years of smooth, virtually effortless storage movement. Note: While the Long Track Keyboard System can use trays less than 13" deep, if 11" deep trays are being mounted it would generally be more practical to purchase the 23" Track version, the Ovation Keyboard Tray System. It will provide the same functionality at a slightly lower cost. The Ovation Short Track Keyboard Tray System combines the proven quality and exceptional adjustment range of the Knape and Vogt Ovation Leverless Arm with the durability and low profile of the Foxbay ABS Plastic Keyboard Trays. Multiple widths and depths of tray are available, permitting users to select the tray that will best accommodate their keyboard and mousing devices while still fitting within the space constraints of the workspace. This "short track" (17″) version of the Ovation Leverless Arm has a good range of elevation adjustment that can meet the adjustment needs of most seated individuals. The shorter track means that it can be deployed in situations where there is insufficient space for mounting a longer 23" track. In order to better accommodate tray storage with a short track this arm is equipped with a shorter neck than the standard 23" model. However, even with the shorter neck trays will still project, even at the lowest setting that offers the maximum storage depth. A 9" tray will still project about 2.5", an 11" will have about 4.5" of tray exposed, and a 13" deep tray will project about 6.5". The low profile, durable design uses a near-effortless patented "Lift-N-Lock" counterbalance mechanism to adjust an attached tray from 6.1" below to a full 2.3" above the mounting point (i.e. underside of the mounting surface). A Height Indicator Gauge makes adjustment easy to measure. The inclination, or "tilt," of the tray can be adjusted from a negative inclination of -15° to +10° using a large Dial-a-Tilt knob that includes an "Inclination Gauge" (allowing the user to reposition at the desired angle). The sleek, low profile design provides excellent clearance for the legs and knees. The arm swivels 360° for side to side movement and the 17" storage track allows tray storage when not in use. The high quality steel ball-bearing storage track has a much longer lifespan than the more common plastic glide systems used by most manufacturers and ensures years of smooth, virtually effortless storage movement. Note: Due to the potential storage issues where there is limited space for track mounting the more specialized Staccato and Tenor tray mounting systems might be of interest. These offer alternative mounting that permits slightly greater storage than the Ovation Short Track Keyboard Tray System. The Ovation Sit-Stand Keyboard Tray System combines the proven quality and exceptional adjustment range of the Knape and Vogt Ovation Sit-Stand Keyboard Arm (23″ track) with the durability and low profile of the Fox Bay Industries' ABS Plastic Keyboard Trays. Multiple widths and depths of tray are available, permitting users to select the tray that will best accommodate their keyboard and mousing devices while still fitting within the space constraints of the workspace. The high quality Ovation Sit-Stand Arm can comfortably meet the standing requirements for users up to 5'7". Taller users may still be able to take advantage of the product but may find that the keyboard is a bit low for standing applications. In addition, when moving to a standing position there needs to be consideration of monitor height which should also be addressed. The durable design uses a near-effortless patented "Lift-N-Lock" counterbalance mechanism to adjust an attached tray from 5.9" below to a full 8.4" above the mounting point. A Height Indicator Gauge makes adjustment easy to measure. The inclination, or "tilt," of the tray can be adjusted from a negative inclination of -15° to +10° using a large Dial-a-Tilt knob that includes an "Inclination Gauge" (allowing the user to reposition at the desired angle). The 23″ long track achieves full storage of trays up to 11" in depth. Deeper trays such as the Extra-Deep Low Profile ABS Plastic Trays from Fox Bay Industries can also be used but will protrude by about 2". 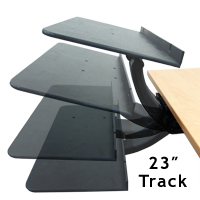 The curved neck of the Ovation Sit-Stand Keyboard Tray System enables a much higher degree of elevation for the keyboard tray than the standard arm options. However, the arc of the arm does drop it down further below the tray which means that there is a slightly greater potential for it to come in contact with the knees, especially if the user draws the tray extremely close to themselves. The arm swivels 360° for side to side movement and the 23" storage track allows the user to store the arm and tray out of the way when not in use. The high quality steel ball-bearing storage track has a much longer lifespan than the more common plastic glide systems used by most manufacturers and ensures years of smooth, virtually effortless storage movement. Note: The Sit-Stand Keyboard Tray System will fully store trays up to 11" deep. Deeper 13" trays can also be mounted but the front 2" of the tray will project from below the desk when the Sit-Stand Arm is fully stored.